There's nothing like coming home from Thanksgiving break (pics to be posted soon) and wanting to make some soup to carry one through the week. I picked this recipe out of Everyday Food and found it easy and delicious. 4 T butter, 2 T olive oil, 1 med. onion- season with s&p and cook until translucent, about 5 min. 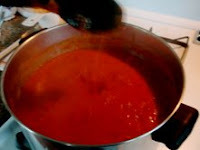 Add spices- thyme, oregano, basil, 30 ounces chicken broth and 2 28 ounce cans diced tomatoes bring to a boil and then reduce heat and let simmer 30 min. blender 5 cups soup, return to pan and serve. yum. Ooooh - I have all these ingredients and love blending soups in our blender nowadays so this sounds perfect. Quick and delicious!